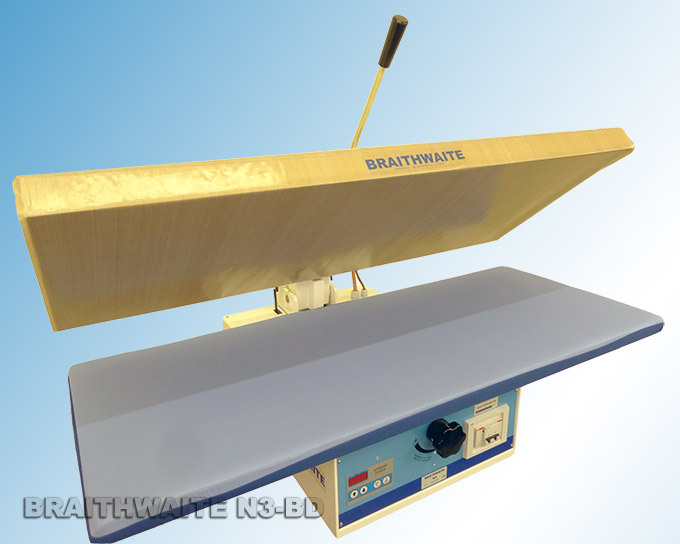 Flat Bed Fusing Presses From J. Braithwaite & Co. Ltd. The Braithwaite N3 manual flat bed fusing press has been designed with versatility and ease of use very much in mind. Its large 120cm x 50cm heated top plate makes it suitable for use in the manufacture of many different types of garments & textiles. The simple to use push button digital controls allow full and fine tuned control of the fusing process: Temperature is electronically controlled from 20oC right up to its maximum of 210oC, The timer can be set from 1 second through to 60 seconds and because the N3 features a unique front mounted, hand adjustable Pressure dial, it is possible to set different pressures without the need of any tools. 3kW 230V Standard 13amp plug. The N3 fusing press has a wide opening top plate with spring lift assistance: which gives full access to the lower area for easy loading & unloading. The heated top plate is fitted with a removable Teflon coated heat resistant screen; which helps prevent the fabrics & interlining sticking to the press. The N3-BD press has a 3kW power rating and for easy installation is fitted with a standard UK 13amp plug. 1) Fusing of interlinings etc. 2) Heat transfer printing (t-shirt transfers etc.). 3) Heat apply of diamante stones & artwork etc. 4) General flat bed Heat press. As N3BD plus free standing work unit. Export model for use outside the UK/Europe.